Microscope World recently helped Loveland High School in Loveland, Ohio furnish their lab with WiFi digital microscopes. The students use Chromebooks during class and can view live images from their microscope, as well as capture images to use in reports. The teachers can also view images from their students' microscopes. The high school lab setup includes the Richter Optica UX-1T trinocular microscope with Plan Achromat objectives, the c-mount adapter, and the Moticam X2 WiFi camera which they are able to plug into their RJ45 network. 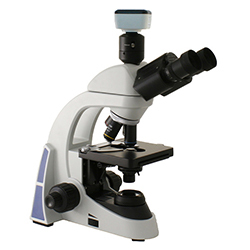 Both the camera and the microscope are rechargeable and can be operated cordless. 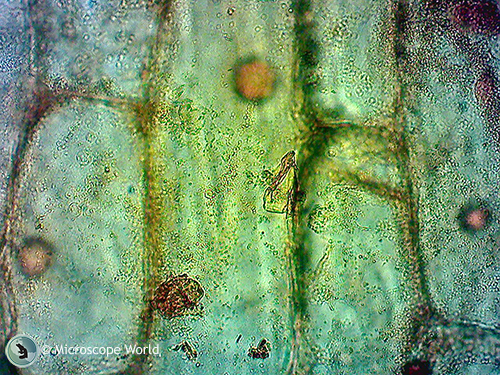 The images below were captured with this digital microscope setup in the cell lab where students are learning to stain. The first sample of onion cells was prepared on a microscope slide using iodine to stain the sample. A cover slip was then placed over the sample. The iodine brings out the structure of the cells and makes the nucleus of each cell stand out more. The second microscopy sample viewed was an elodea leaf. This is an aquatic plant also referred to as a waterweed. The elodea leaf was prepared with a salt water solution added to the sample to show that once salt water (a hypertonic solution) is added it causes water to move out of the cell by osmosis. 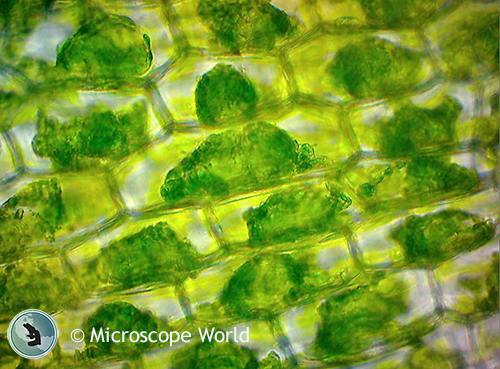 This is an image of onion cells. The sample was stained with iodine prior to placing it under the Richter Optica UX1 microscope. The image was captured at 400x using the MoticamX2 WiFi microscope camera. 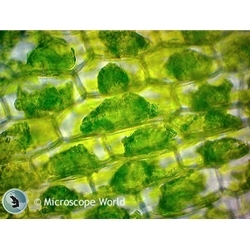 This is an image of a waterweed (Elodea Leaf) that was prepared using a hypertonic saltwater solution to show water moving out of the sample by osmosis. The sample was captured under the Richter Optica UX1 microscope using the MoticamX2 WiFi microscope camera at 400x magnification. To learn more about different options for setting up your high school laboratory with student microscopes or a digital classroom Contact Microscope World.